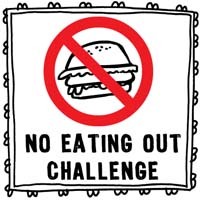 Christina has issued a challenge for November: No Eating Out. I don’t really struggle with eating out for dinner, but I do sometimes struggle with eating out for lunch while at work. Christina asked me to share some of my tips for successfully bringing my lunch to work. If you are trying to bring lunch from home to your work place, read on for tips that work for me. Plan Ahead. You knew this one was coming, didn’t you? Well, it is the number one strategy to employ in your plan to bring lunch from home. Planning a menu for the week and stocking up during the weekend, so you have what you need during the week is a great plan for success. Planning evening meals so that you have enough leftovers to work with for lunches is also a great way to plan. Know what you will bring before you go to bed, because nothing is going to magically come together in your refrigerator overnight (although, wouldn’t that be nice?). Indulge yourself. Treat yourself to real, good foods. Even if you are on a budget, making room for fresh sprouts and whole grain rolls for your sandwiches or deli pickles and fresh fruits in your lunches will keep you from feeling deprived as you bring your lunch from home. I will admit this to you: I have brought a lame-o sandwich for lunch, only to toss it in the trash when one of my co-workers asked me to go out for lunch. When it comes down to it, you want to enjoy a tasty meal, so take the time to make one that will satisfy you. Rethink leftovers. I love salads for lunch, but only if they are substantial. Leftovers from dinner can lend themselves to a tasty salad the next day. Bits of bacon, pork, chicken, chicken, cooked peppers, onions, peas, corn and beans are all great on salad. Add some cheese, olives, croutons and a great homemade vinaigrette – yum! I also love meatloaf sandwiches, leftover soup (I bring a smaller bowl and a salad and bread to go with it). You can put just about anything in a tortilla and have a great lunch. If you really hate eating the same thing two days in a row, freeze leftovers to be used for lunch next week and break things up a bit. Cook in bulk. When you cook at home, make enough extra for lunches. Soups with a clear broth freeze well in a mason jar (leave about an inch of space at the top to allow for the liquid to expand). Most casseroles freeze well and you can freeze individual portions to grab and go. Even sandwiches can freeze well – let thaw overnight and add fresh veggies before you head off to work. You don’t have to choose freezer items only – lots of dishes can be made ahead and stored in the refrigerator for later in the week. Have a back-up plan. Some days the inevitable will happen – you did not have time to go to the store, you left your tasty, packed lunch on the counter at home, you overslept – whatever. Have a back-up stash at work. If your work has a refrigerator/freezer, then leave a couple of jars of frozen soup in the freezer as back up. Have some high fiber, high protein cereal and some almond milk (it lasts much longer than cow’s milk) on hand to grab a bowl of cereal as needed. If you only have a small drawer, put in one or two of those steamers meals (such as Healthy Choice). Add in some high fiber granola bars, a jar of nuts with dried fruit, whole grain crackers and similar items are packed with fiber and protein to keep you full and satisfied (and away from the vending machine). One last thought: As always, no one is perfect and life does not always go as planned. Cut yourself some reasonable slack and try to learn when you trip up. Be honest with yourself. If eating out is an important part of your work day, then plan it in once or twice a week, so you are not depriving yourself all the time. If you love a sweet snack during the day and tend to hit the vending machine, bring something sweet from home instead. It will make your overall plan much easier to stick with.